Not Going to Vector This Weekend? Love Drum & Bass? Since I know not EVERYONE on my friends list is going to be at Vector this weekend, and I know at least SOME of those people who might be into and up for some Crazy Drum & Bass action and a great after party, at the world famous 3 clubs in one Penthouse Club. I'll be heading over for the VIP after party, to meet up with Natalie after I'm finished spinning at Vector. I thought I'd spread the word on this killer event. 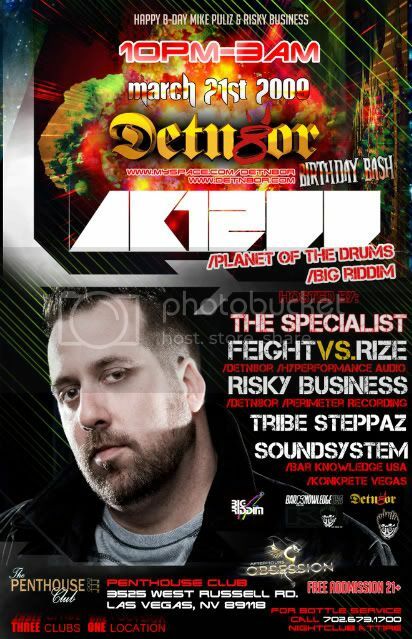 That's right, your chance to see AK1200 with The Specialist, Feight Vs Rize, Risky Business, Tribe Steppaz, Soundsystem and more. $50.00 VIP Party Package includes. . . There are a limited amount of seats left for this event so reserve your spot now as Seats will be sold on a first come first serve basis. The cutoff for sales is Friday Night, this secures your place, and lets us know how many Hummers it will be. Toby from naked events will be in touch regarding scheduling and logistics once the order goes through. P.S. Make sure to tell them razorslave sent you in the paypal order comments.